Your day-by-day itinerary now includes Full House House as well as Palace of Fine Arts Theatre. On the 14th (Mon), wander the streets of Union Square, take in the waterfront at Fisherman's Wharf, and then step off the mainland to explore Alcatraz Island. 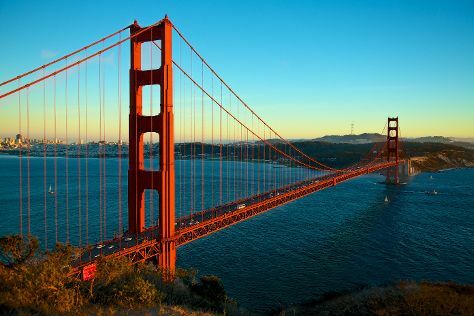 Get ready for a full day of sightseeing on the next day: don't miss a visit to Full House House, then catch a live performance at Palace of Fine Arts Theatre, then snap pictures at Golden Gate Bridge, and finally stroll through Golden Gate Park. Planning San Francisco trip won't be overwheling when you use's Insprock itinerary maker. New York City to San Francisco is an approximately 9-hour combination of bus and flight. You can also fly; or drive. Traveling from New York City to San Francisco, you'll gain 3 hours due to the time zone difference. While traveling from New York City, expect a bit warmer days and much warmer nights in San Francisco, ranging from highs of 59°F to lows of 46°F. Wrap up your sightseeing on the 16th (Wed) early enough to drive to San Jose. You've added Intel Corp and Museum, Winchester Mystery House, Apple Park Visitor Center, and other attractions to your itinerary. On the 16th (Wed), make a trip to Google Android Lawn Statues, explore the galleries of Intel Corp and Museum, admire the striking features of San Jose City Hall, then examine the collection at The Tech Museum of Innovation, then delve into the mystery of Winchester Mystery House, and finally don't miss a visit to Apple Park Visitor Center. Plan my San Jose trip by asking Inpirock to come up with tips and suggestions. You can drive from San Francisco to San Jose in an hour. Alternatively, you can take a bus; or take a train. In January, daytime highs in San Jose are 61°F, while nighttime lows are 42°F. Finish up your sightseeing early on the 16th (Wed) so you can travel to Los Angeles. Your list of things to see and do now includes Rodeo Drive, Sunset Boulevard, Universal Studios Hollywood, and other attractions. There's lots more to do: see the interesting displays at The Getty Center, look and learn at Griffith Observatory, take a leisurely stroll along Santa Monica Pier, and get to know the fascinating history of Hollywood Walk of Fame. To see traveler tips, where to stay, maps, and tourist information, use the Los Angeles sightseeing planner . You can fly from San Jose to Los Angeles in 3 hours. Other options are to fly; or drive. Expect somewhat warmer temperatures when traveling from San Jose in January; daily highs in Los Angeles reach 70°F and lows reach 49°F. On the 19th (Sat), you'll travel back home.